It's no secret that we at TRE love stories. And to celebrate our 200th post, we thought, What better way to celebrate than by sharing some of your stories?! Five amazing women sent us a story; one snapshot, if you will, of a picture of their lives. Some are warm and dear, others are hard and heartbreaking. But they are all real. And they are all life. And, as people, we can relate to the emotion conveyed through their stories. But, as if sharing stories wasn't enough, we are also partnering with Broken and Beautiful to create a one-of-a-kind storyteller necklace for one lucky (randomly chosen) entrant! 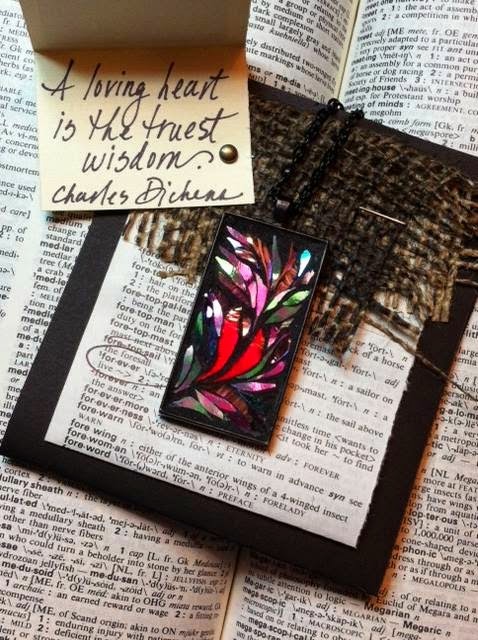 You'll find more of their story, as well as the winner of the necklace, at the end of this post. We kept slipping and falling and laughing. It was extremely icy out that night. My good friend and I were heading over to the business building across the street from our college apartment. Everywhere was black ice. Our usual two-minute walk took at least fifteen. Every step was measured and every step one of us took a fall. If she fell, I would put out a hand to pull her up. She went up and I went down. She would put out a hand, pull me up, and down she went. On and on it went. But we laughed throughout it all. Loud, tears-in-eyes, two-college-girls-being-silly laughs. The great part about this memory – it still holds true today. We still put out a hand when the other falls. Because when one falls – and, inevitably, one of us will – we lift the other up. We might be slipping on life, not ice, but the hand extended is always there. And so are the laughs. The joyful, trying-to-juggle-motherhood, good friend laughs. Over time, phone calls have replaced extended hands, but the help and laughter remain. And so has the friendship. To read more of Katie's story, you can check out her website here. I love my husband with a fierceness that, after 16 years, still takes me by surprise. He is tender, and brilliant, and creative, and generous. He makes me laugh more than anyone I've met. And he is an addict. His continued dependence on alcohol, tobacco, and marijuana breaks me. I want him to be restored. Healed. But the addiction is deceptive. It covers the eyes and muffles the ears of the addict. The mirror of self-examination turns into a magnifying glass for finding fault with others. The addiction covers a loving heart with the insulation of self-interest. It convinces the addict that love should be easy; that real relationships escape challenge; that acceptance is king. So, the loving observer is only that – an observer. And that hurts. Only God can change him, and I try to be patient, and learn. I have learned to depend on God, because all other rocks will crumble. I've learned the joys of complete transparency with friends who care. I've learned to ask for help (sometimes). Most importantly, I've learned how difficult it is to love as God loves us - to see beyond a person's habits and weaknesses to the perfect creation we once were, and will be again. Honestly, I can't do it without Him. To read more of Amy's story, you can check out her website here. For the last five years, I’ve attended a women’s retreat with my two girlfriends, Nancy and Leslie. Our first year together was especially memorable. We laughed, cried, prayed and other than a little run-in between my car and a fence (don’t ask), we had a great time. On our way home, Nancy and I decided to give Leslie a lesson in text messaging. She had one of those phones with three letters assigned to each number and equipped with the predictive text feature. After our short lesson she sent her first text to her son, Daniel and the predictive text worked great. Then it was time to send a message to her son, Bryan, and well, let’s just say that her son is now referred to as Aswan. Predictive text gone wrong! It still makes us laugh. Laughter – such good medicine. To read more of Nancy's story, you can check out her website here. As my mind cleared from the dream I had just escaped, I realized my phone was ringing. What time was it? About 4 a.m., a terrible time to call! When I begrudgingly answered, “Hello,” I heard my mom’s voice on the line, totally awake. Protect me? By lying to me most of my life? Wow. All I could muster in reply was, “Don’t call me for three months.” I hung up and began a journey with God that forced me to deal with bitterness, anger, fear, and betrayal. This doesn’t explain the abuse I suffered at her hands, but it does explain what I now believe to be a severe mental illness within my mom that continually affects our family. This is a pivotal part of my story which I am coming to accept as a ministry. To read more of Holly's story, you can check out her website here. Waiting on God. It’s been the story of my life these past two years as my husband and I prepare to be missionaries to Panama. This was not the life path we would have chosen, but it is the one laid before us, and we are excited to walk this road. But it’s been hard. In a culture that wants instant gratification, waiting can be difficult. It can make you question if this is what God really has for you. But God’s timing is not our timing. And he is not always so much in a hurry. And I’m finding that in this season of waiting, God is weeding out things I’ve had dependence on—material things (we’ve sold most of our possessions), job security, home—to prepare me for what is to come. But I still struggle. Sometimes I want to step back into my old life because Panama is just not happening right now. And then God sends some encouragement, some sign, that we are still on the right path. And I wait. Finding myself more and more in a place of completely trusting God. Because really, whether I’m here or in Panama, relying (and waiting!) on God is the most important place I want to be. To read more of Jenn's story, you can check out her website here. Each “Broken and Beautiful” pendant is imperfect by design. I use broken vintage glass, and each tiny piece is placed just as I pulled it from the “wreckage.” These miniature mosaics are unique, each with a different message. No two will ever be exactly alike. The list of our human struggle is endless. You may be experiencing loss, hardship, illness, abuse, severed relationships, addictions, hopelessness in all shapes and magnitudes. The truth is that we are all broken. The precious good news is that we are also beloved, and we are beautiful. It is my hope that wearing one of these mosaics will remind you of a memory, passion, or experience that brings comfort, healing, and joy. 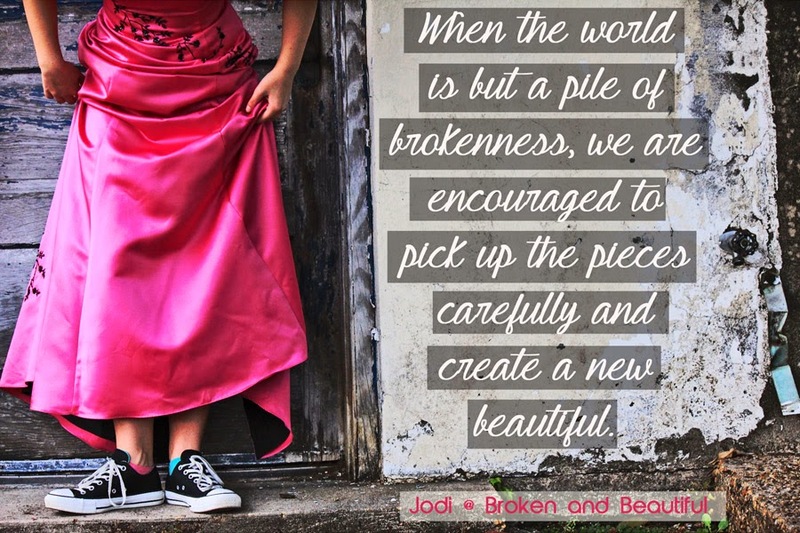 When the world is but a pile of brokenness, we are encouraged to pick up the pieces carefully and create a new beautiful. You, my friend, are the precious masterpiece. And without further adieu, the winner of the storyteller necklace is Amy Adams! Congratulations, Amy! And thanks to every woman who shared their story with us! *Today we're once again linking with the lovely Holley Gerth. Thanks for the chance to post on your site and the shout out! It was fun! Wahoo! I love the beautiful necklaces and the beautiful story of how and why they are made! Thank you for inviting us to tell our stories. The older I get, the more I realize the power of honest sharing. I am continually encouraged by the bravery, wisdom, and good humor of others. And I am continually amazed by our God, who can and does redeem every situation. I couldn't agree with you more Amy! Thanks again for being willing to share your story!! Wow! These all brought different tears to my eyes! They all are beautiful! Made me get sniffley!